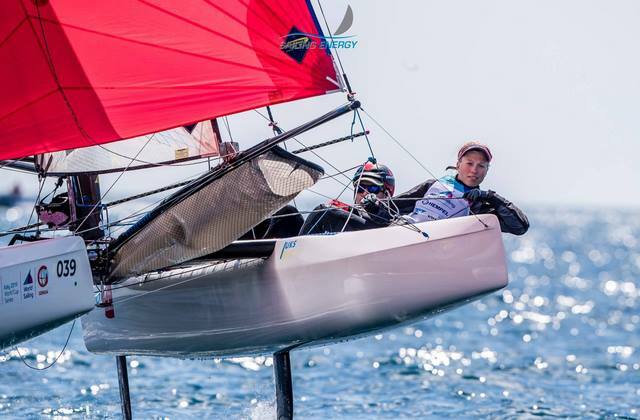 Hitting the top of the 49-boat 49erFX fleet holds special relevance for van Aanholt and Jongens as the event is the first of two qualification events for Dutch qualification to Tokyo 2020 in the 49erFX, so the stakes are high. Four other Dutch teams are currently competing and sit in ninth, 18th, and 36th. Van Aanholt and Jongens’ fleet, the yellow, completed three races in the 49erFX whereas the blue completed two. 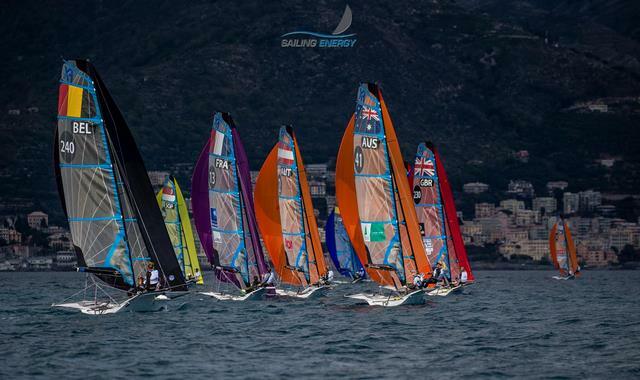 The 49erFX fleet now has five complete races which has brought the qualification process to a close, enabling gold and silver fleet racing tomorrow. 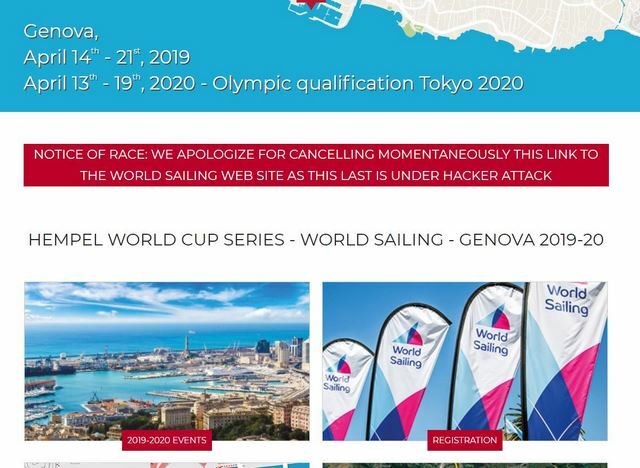 Hempel World Cup Series Genoa is an important event for many teams with country Tokyo 2020 qualification battles heating up, but for Van Aanholt and Jongens, their perfect day has gone a long way in giving them an early initiative. Van Aanholt continued, “Our trials are here and at the 2019 European Championship in Weymouth [Great Britain]. Both regattas are weighted equally so it is important to do well here and there. “To pick up points towards the trials you have to finish in the top ten. If you finish tenth you take one point and if you finish first you take ten points. If you finish outside of the top ten, you get no points. At the end of the whole thing it’s who gets the most points goes. Their performance has given them a good grounding for the remainder of the event. They currently lead on eight points followed by Sweden’s Klara Wester and Rebecca Netzler on 11 and Julia Gross and Hanna Klinga (SWE) third on 17. Dutch rivals and 2018 World Champions Annemiek Bekkering and Annette Duetz remain firmly in the hunt for points in the qualification process. They are ninth, just 13 points off the leaders. 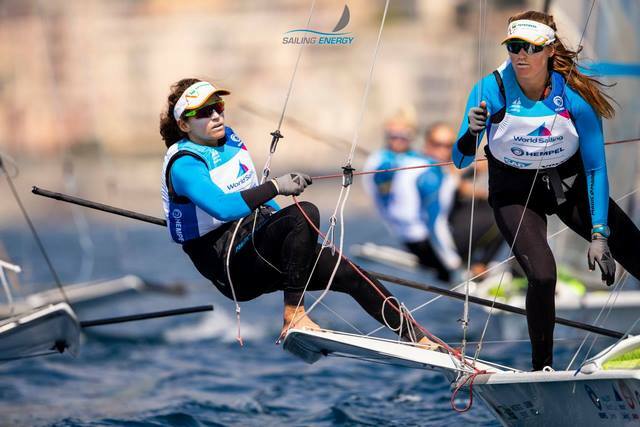 Willemijn Offerman and Cecile Janmaat (NED) are 18th on 33 points with the final Dutch team of Dewi Couvert and Tess Wilschut in 36th and out of contention for points as they did not make the gold fleet. 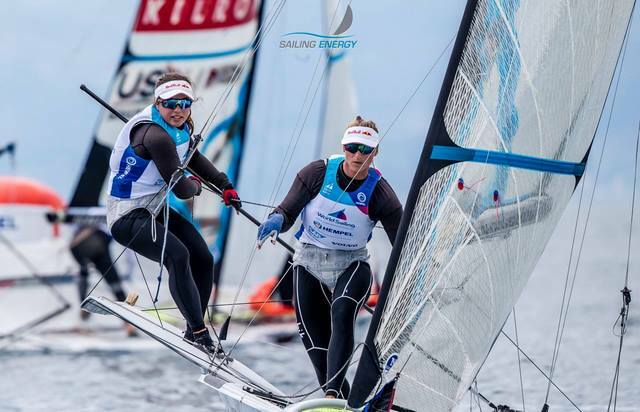 Plenty of racing remains in the 49erFX with four races scheduled for tomorrow to determine the top ten that will advance to the Medal Race the following day. 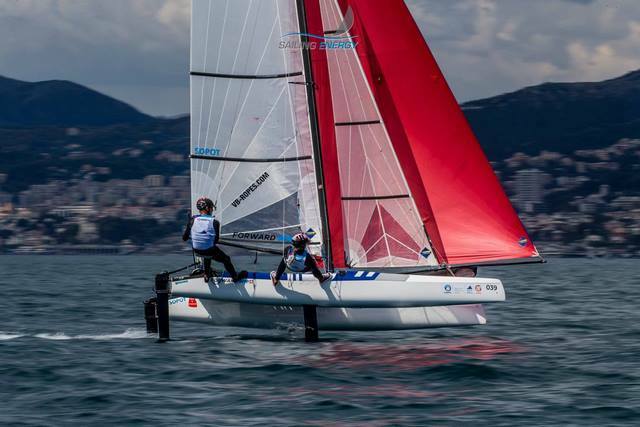 The 49er also completed their qualification series. 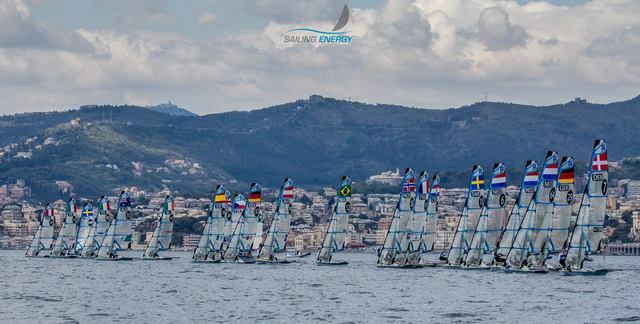 The yellow fleet sailed four races and the blue completed three as the scores from five races are combined. 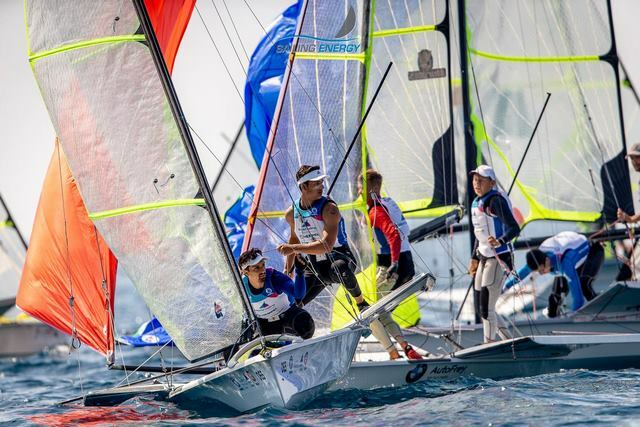 Croatia’s 2018 World Champions Sime and Mihovil Fantela took three wins out of five and hold the lead on 14 points. They are three clear of Diego Botin and Iago Lopez Marra (ESP). Australian brothers David and Lachy Gilmour are third. The top 33 racers will advance to gold fleet racing tomorrow before the top ten progress with the 49erFX to the Medal Races. After a patient two day wait ashore for breeze, the 20-boat Finn fleet finally took to the water for three races. 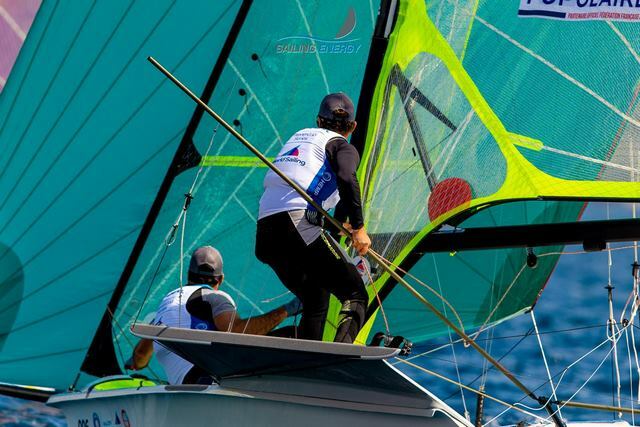 Finland’s Oskari Muhonen reveled in the light winds in Miami, winning the Medal Race which gave him a silver medal. He excelled once again in Genoa’s light wind clinching a 1-(2)-1 scoreline. Jorge Zarif (BRA) took the third race win of the day and is second overall with Alex Muscat (ESP) in third. Much like the Finn, the Men’s and Women’s 470 also commenced racing but were only able to complete one race each. Nikolaus Kampelmühler and Thomas Czajka (AUT) took the Men’s 470 victory ahead of Japan’s Naoki Ichino and Takahashi Hasegawa. In the Women’s 470, Gil Cohen and Nao Lasry (ISR) beat Fernanda Oliveria and Ana Luiza Barbachan (BRA) and Amy Seabright and Anna Carpenter (GBR) to the finish. 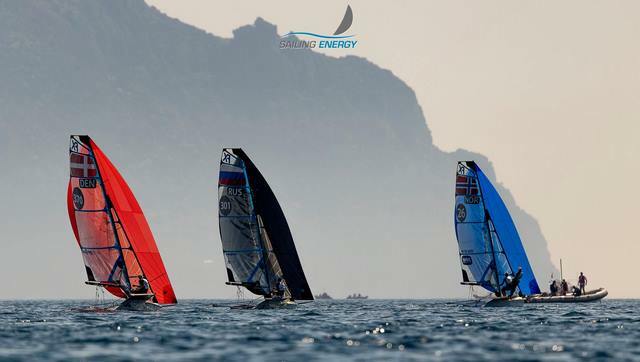 Two blue and one yellow fleet race was completed in the Nacra 17 to establish an overall scoreboard with three results. 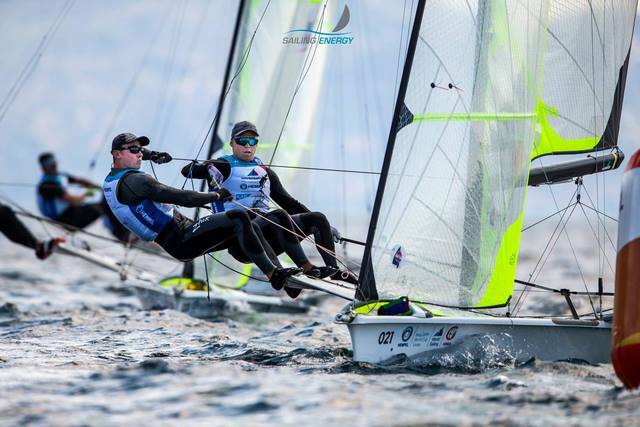 Ben Saxton and Nicola Boniface (GBR) took a race win and a second in the blue fleet and now lead on two points. 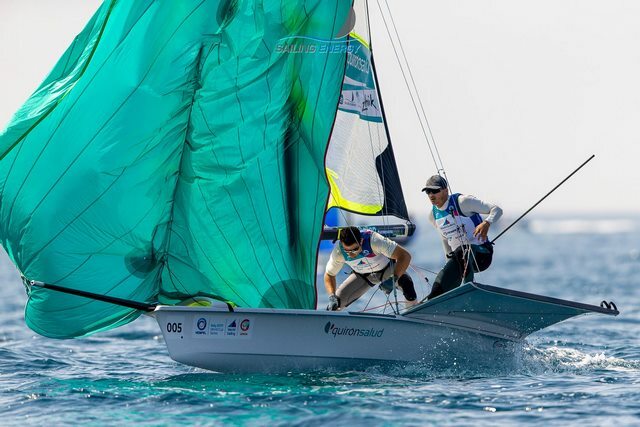 Gemma Jones and Jason Saunders (NZL) finished third in the only yellow fleet race which was enough for them to move into second. 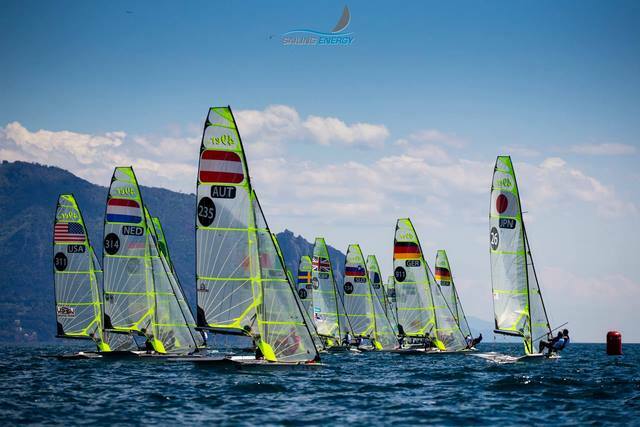 The single yellow fleet race win went to Denmark’s Lin Ea Cenholt and Christian Peter Lübeck who are 12th overall. Three Laser blue races and two yellow races were completed. 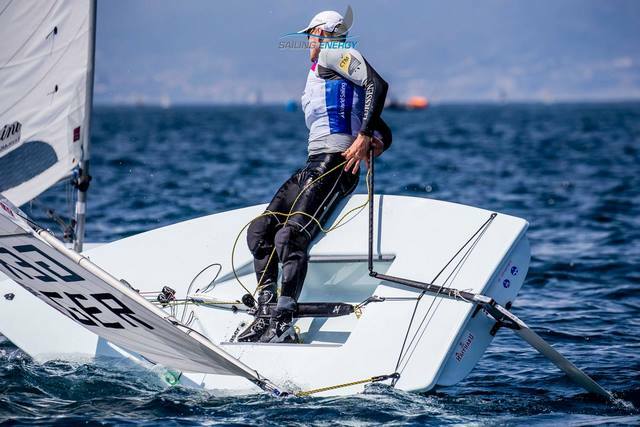 Tonci Stipanovic (CRO) sailed his way to a second, tenth and a 36th. His 36th does not yet count as the yellow fleet are a race behind. He holds the lead but he currently discards his tenth but his discard will be his 36th once the yellow fleet catch up. Most of the competitors hold high scores so once the yellow fleet complete their fourth, plenty more shuffling around is expected. 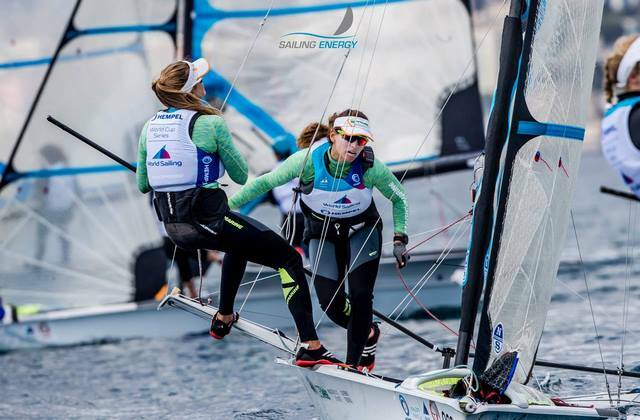 The Laser Radial pushed to complete a race but it was just not possible as the wind died towards the latter part of the afternoon. Line Flem Høst (NOR) and Maud Jayet (SUI) remain tied on a point each after one yellow and blue race. Racing starts at the earlier time of 10:00 local time tomorrow as the Race Committee look to capitalize on a stronger breeze forecast early in the morning. 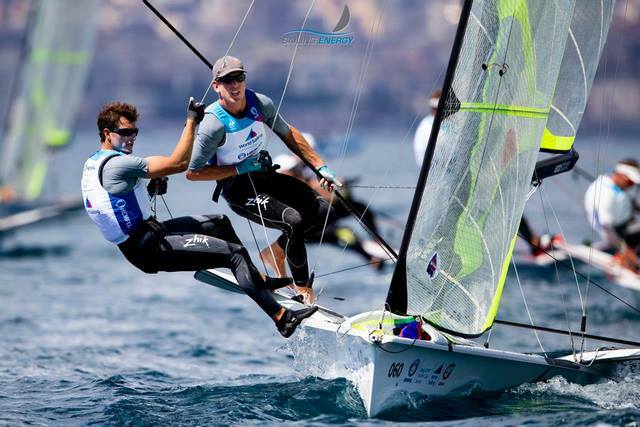 • 49er Men (5 races): 32nd Judge Ryan/ Hans Henken (USA). 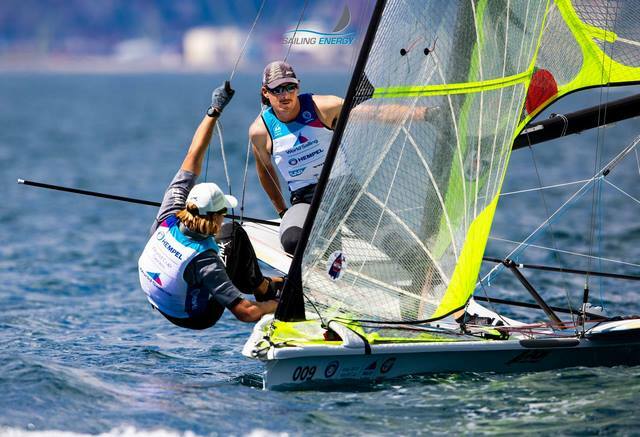 • 49erFX Women (5 races): 6th Stephanie Roble/ Margaret Shea (USA). 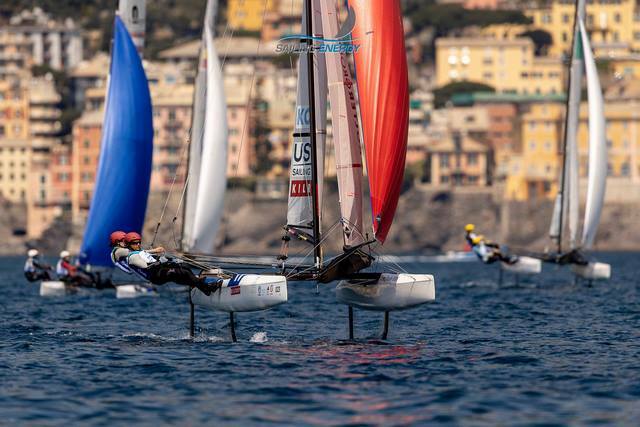 • Nacra 17 Mixed (3 races): 8th Ravi Parent/ Caroline Atwood (USA). • Laser Men: Incomplete – some entrants have three races while others have four races. • Laser Radial Women (1 race): 5th Isabella-Anna Bertold (CAN). 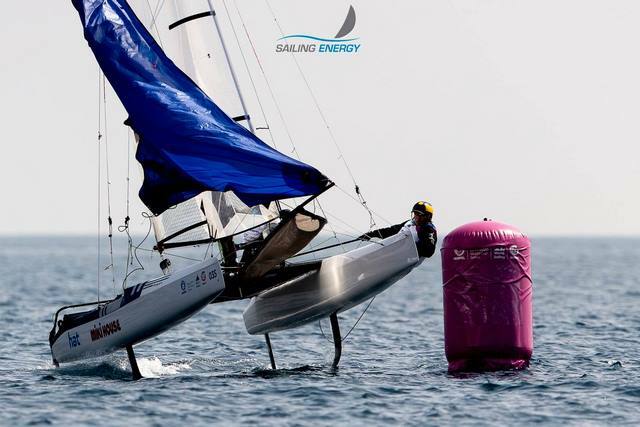 • 470 Men (1 race): 8th Stuart McNay/ David Hughes (USA). • 470 Women (1 race): 9th Atlantic Brugman/ Nora Brugman (USA). • Finn Men: No entrants. • Laser Men: Marek Zaleski, Malcolm Lamphere, Henry Marshall, Paul Didham (USA).